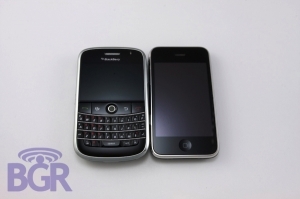 BlackBerry Bold vs iPhone 3G | BlackBerry Blast! There has been a lot of buzz about the iPhone and the BlackBerry Bold. Loyalists in both camps love their phones and can't imagine using the other device. BGR takes both for a spin an compares the two most popular devices this year. Interestingly, the iPhone 3G seems to be built better yet the BB Bold's screen is better because of a dense pixel-per-inch ratio. Wouldn't you have guessed the opposite? Click through to BGR's full review. It's worth the read.